Expert Service. Unbeatable Prices. Expect that from Best Buy this holiday shopping season! Do you love new technology? You can experience the latest and greatest for this holiday season at the Best Buy Holiday Shopping Event! 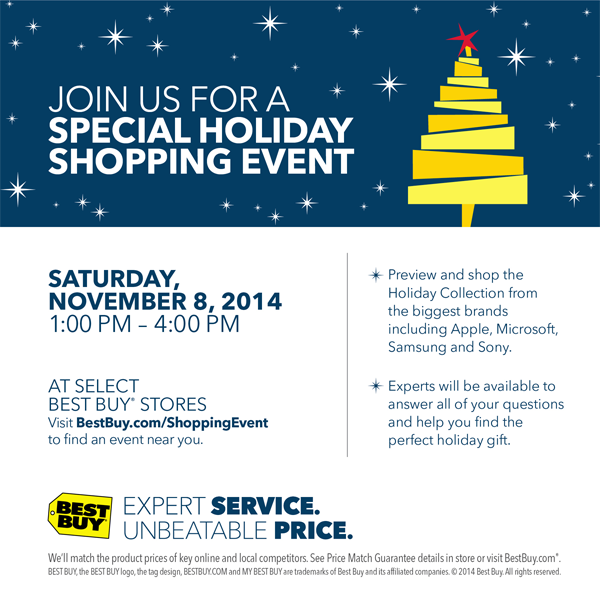 Join Best Buy for a special holiday shopping event Saturday November 8, 2014 1:00 pm – 4:00 pm. Preview and shop the Holiday Collection at Best Buy from the biggest brands including Apple, Microsoft, Samsung and Sony! Plus, Best Buy will have experts available to answer all of your questions and help you find the perfect holiday gift. The following disclaimers apply to all offers: Unless noted, rainchecks are available for advertised products. We reserve the right to limit quantities. No dealers. Other limitations may apply. Not available online. Visit www.bestbuy.com/ShoppingEvent for more great offers, details, vendor demonstrations and to find participating stores in your area. What offer above are you most excited about? Can you check anyone off your holiday shopping list with these great offers? I’m loving the Apple offers! I love Best Buy, Ill be there! I want to surprise the hubby with that 55-inch Samsung TV for Christmas. Hoping to head there this weekend! Have a lot of tech gifts on my holiday shopping list!